If you’re thinking about building a tree house, keep a few things in mind. Have you been considering building a tree house on your property? Tree houses can be a fun and fulfilling addition to your home for young and old alike. There are many things to be aware of, however, as you plan for the construction of your tree house, as this fun addition will seriously alter the composition of the tree it will be constructed upon. Ideally, your tree house should be built on a disease-free, injury-free tree. The presence of disease or injury does not automatically disqualify it from being used, but you should have a specialized arborist evaluate your tree to make sure it can safely withstand the physical rigors of supporting a tree house. Tree houses are attached to trees with strong bolts (Tree house Attachment Bolts, or TABs) that do not bend or break under normal circumstances. However, the stresses of high loads may lead to a compression of the wood tissue which would cause the tree house to fail. It is safer to use hardwood trees such as oak, cherry, and walnut trees as these are hardier and less susceptible to tissue compression. Softer trees could potentially still be used if a lighter tree house design is used. And some trees ought never to be used. A tree house will introduce several environmental changes to your tree. Foot traffic is the most potentially damaging, compacting the soil around the tree. To limit the damage to your tree, create as few footpaths as possible to the tree house using barriers and wood chips where feasible. Also, inform guests not to physically damage your tree with actions such as peeling off bark or smacking it with other sticks. Finally, be cautious about digging and removing other trees from the vicinity, keeping in mind that a tree’s roots often extend 2 or 3 times farther out than the branches. 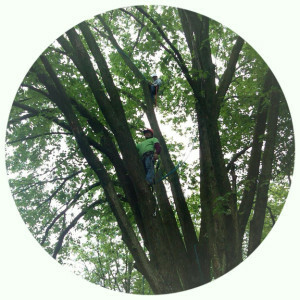 Nelson Tree Specialist provides specialty arborist services, tree crane services, tree care services, and dead tree removal services. We are well known for our top-notch skills and professionalism. All of our workers are experts at caring for a variety of tree species, so any tree that’s in your yard will be expertly treated or removed. We are members of the International Society of Arboriculture and we are considered certified arborists. We are also an accredited business through the Better Business Bureau and we have great reviews through Angie’s List. To find out how we can help your trees, whether they are exotic and strange or normal and plan, give us a call at (301) 854-2218 (Washington, D.C.) or (202) 909-5662 (Baltimore) or visit us online. For more interesting tree facts and tips, follow us on social media on Facebook, Twitter, and Google+. This entry was posted on Friday, September 2nd, 2016 at 12:39 pm. Both comments and pings are currently closed.